Nutrition and natural food expert Leah Vanderveldt puts the joy into plant-based cooking with over 100 easy and inventive recipes that redefine the boundaries for nourishing food. 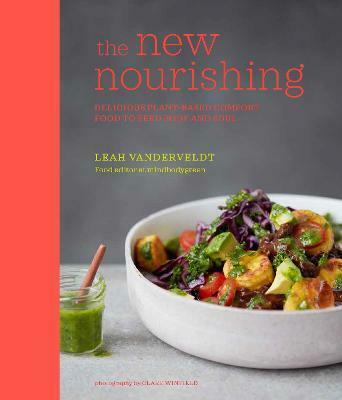 As the food editor for the health and wellness website MindBodyGreen, Leah is constantly in conversation with readers, nutritionists, chefs and contributors about food and with this book she offers a new outlook on eating plant-based dishes for health and well-being. This is unashamed comfort eating - big hearty bowlfuls, packed full of goodness and rich in flavour. Her philosophy is to get the maximum enjoyment from foods by using seasonings and cooking techniques in over 100 simple recipes that offer indulgence and balance all at once. Affordability and accessibility is key, too, and these tasty, comforting and hearty meals are designed to bring excitement to the palate. Expect lots of colour, texture and flavour, with combinations of spice and freshness, creamy and crunchy, umami, sweet and sour. Try Spiced Buckwheat Porridge, Chickpea Crepes with Mushrooms and Thyme, Peanut Butter and Banana Whip Bowl with Toasted Coconut and Seeds, Coconut Broth with Courgette Noodles and Mushrooms, Red Lentil Dahl, Winter Roasted Veg Bowl with Honey Balsamic Dressing, Curry-infused Quinoa with Herbed Black Lentils, Veggie Tacos with Five-seed Slaw, Planty Paella, Cauliflower Fritters with Tomato Chutney, Peanut Butter Cookies and Chocolate Bark with Dried Cherries and Almond Flakes. Plant-based comfort food incorporates an abundance of plant foods in meals that nourish the body and soul. It isn't heavy or overly rich, it can be light and healthy, while still being filling and flavourful. It's fresh and satisfying, The New Nourishing. Leah Vanderveldt is the food editor at health and wellness website, MindBodyGreen, where she writes and develops whole-food recipes and edits content about nutrition, health and cultivating a positive relationship with food. She has worked previously for Vogue and Vanity Fair in the US, as well as for lifestyle and design magazine Home Beautiful in Australia. She is certified in Culinary Nutrition from the Natural Gourmet Institute in New York City and lives in Brooklyn with her husband, Fabian.